Teddy's Bigger Burgers won the vote for having the best burger on Oahu. Gracie Thacker serves up a Monster Double with mushrooms and onions. Call it fast food, or good food quickly, the fact is we love our meals hot, fast and easy to handle. But make no mistake about it, topping the best burger category is anything but an insult to the palate. 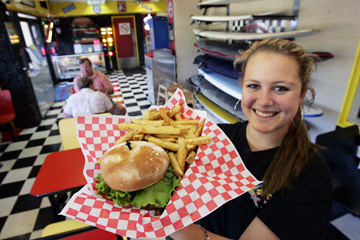 Teddy's Bigger Burgers, voted by Star-Bulletin/Midweek readers as best burger on Oahu, offers big juicy sandwiches, hand-scooped milk shakes and a decor that harkens back to a time of car hops, surfing and rock 'n' roll. Ted Tsakiris, the Ted behind Teddy's, sounds almost political when he talks about the success of his restaurants. "Our principle beliefs revolve around a one-burger, one-customer experience and the work environment needed to achieve this mission." Tsakiris is quick to point out that Teddy's is not a fast food restaurant. "We do take longer for both shakes and sandwiches. However, you can't rush freshness. The fresher the product, the longer the wait. We like to believe it's worth it." Evidently so do Oahu diners. Any list of must-visit restaurants has to include a spot popular with locals for more than four decades. And there's no better place for Hawaiian grinds than Ono Hawaiian Food. Owner Toya Shimabukuro credits stability with keeping the food quality high and the customers coming. "My mom (Sueko Ohyoung) started it. I got a sister working here, a cousin, a few sons and nephews. That definitely helps," she said. The familiar pink box. The aroma of fresh-baked manapua. So wonderfully delicious it must be Libby. 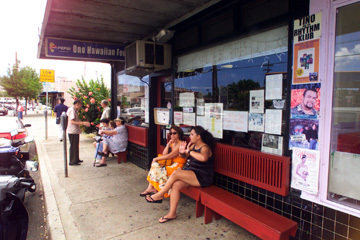 Ono is as famous for its long lines as it is for the lau lau, and don't expect that to change. "It's a family business and the more we expand, I feel, things might change," Shimabukuro said. "We don't have a fax machine. We don't have a computer. We're old-fashioned. We do things like we did in the old days." Show up to your new job with that familiar pink box of steamed treats and you'll make instant friends. Since 1962, Libby Manapua Shop has been satisfying its customers with a simple menu centered around one of Hawaii's favorite foods. Char sui pork, chicken or black bean. Take your pick, you'll find no better. "A lot of people say it reminds them of the old style char sui manapua," manager Sandy Ambriz said. "We try to keep everything lean so it's not oily." Though Libby's has been on the lips and taste buds of islanders for years, hearing the good news is always fun. "It must mean that we are doing something right," Ambriz said. Other winners are: L&L Drive Inn (plate lunch), Genki Sushi (sushi), Legend Sea Food (Chinese food), John Dominis (seafood), Assaggio's (Italian food), Ruth's Chris (steakhouse), Liliha Bakery (bakery), Cold Stone Creamery (ice cream), Leonard's Bakery (malasada), Gulick Delicatessen (okazuya), Kapiolani Coffee Shop (oxtail soup), Gyotaku (Japanese food), Todai (buffet), Matsumoto's (shave ice), Zippy's (family dining and late-night eats), Tamashiro Market (fresh fish), Orchids (Sunday brunch) and Tsukenjo Lunch House (lunch wagon), McDonald's (fast food), Mai Tai Bar (happy hour), Down to Earth (vegetarian), Palomino Restaurant (business lunch), Cheesecake Factory (dessert), Michel's at the Colony Surf Hotel (romantic), Subway (sandwich), Starbucks (coffee), Phuket Thai Restaurant (Thai), Hale Vietnam (Vietnamese), Elena's Home of Finest Filipino Foods (Filipino), Kim Chee (Korean), and Aaron's Atop the Ala Moana (restaurant/view). 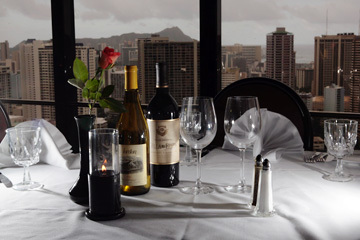 At Ono Hawaiian Foods, a friendly, comfortable atmosphere adds to a great experience. 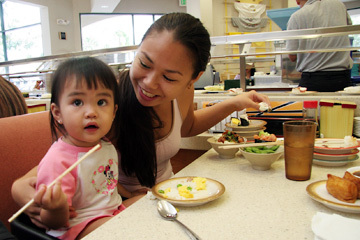 Sushi eaters of all ages can enjoy the offerings at Genki Sushi. Everything's great at Liliha Bakery, and the coco puffs, they're to die for. Carol Asentista holds tray full of heaven. Starbucks is an easy-going place to sip java, talk with friends or get a little work done. 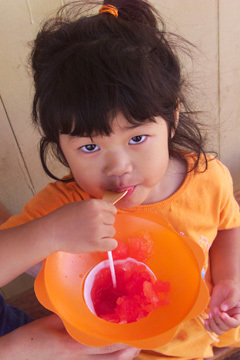 ...or shave ice from Matsumoto's, cold treats put a smile on everyone's face. 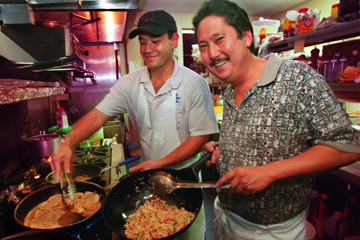 Pork chops and fried rice, cooked up by Matt Toya and Colin Nishida are broke the mouth staples at Side Street Inn. 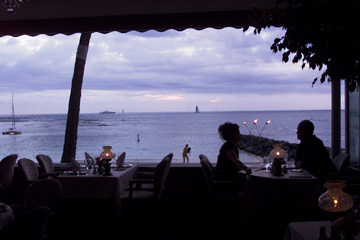 Michel's at the Colony Surf is perfect for romantics. The setting is elegant and the view from Aaron's is beautiful.